spring-data-rest, a recent addition to the spring-data project, is a framework that helps you expose your entities directly as RESTful webservice endpoints. 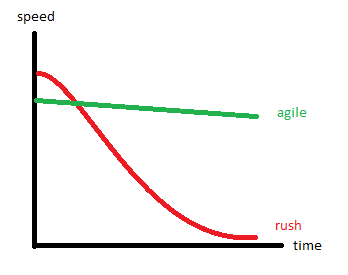 Unlike rails, grails or roo it does not generate any code achieving this goal. spring data-rest supports JPA, MongoDB, JSR-303 validation, HAL and many more. It is really innovative and lets you setup your RESTful webservice within minutes. In this example i'll give you a short overview of what spring-data-rest is capable of. I'm gonna use the new Servlet 3 Java Web Configuration instead of an ancient web.xml. Nothing really special here. I am initializing hibernate as my database abstraction layer in the AppConfiguration class. I'm using an embedded database (hsql), since i want to keep this showcase simple stupid. Still, nothing special here. Oh, well thats a bit short isnt it? Not a single line of code required for a complete setup. This is a really nice application of the convention over configuration paradigm. We can now start creating spring-data-jpa repositories and they will be exposed as RESTful resources automatically. And we can still add custom configuration to the WebConfiguration class later if needed. The Initialization was really short and easy. We didn't have to code anything special. The only thing we did was setting up a database connection and hibernate, which is obviously inevitable. Now, that we have setup our "REST Servlet" and persistence, lets move on to the application itself, starting with the model. I'll keep it really simple creating only two related entities. To finally make the entities persistent and exposed as a RESTful webservice, we need spring-data repositories. A repository is basically a DAO. It offers CRUD functionality for our entities. spring-data takes away most of your programming effort creating such repositories. We just have to define an empty interface, spring-data does everything else out of the box. Still, it is easily customizable thanks to its design by convention over configuration! Again, there is nearly no code needed. Even the @RestResource annotation could be left out. But if i did, the path and rel would be named after the entity, which i dont want. A REST resource that contains multiple children should be named plural though. Our RESTful webservice is now ready for deployment. 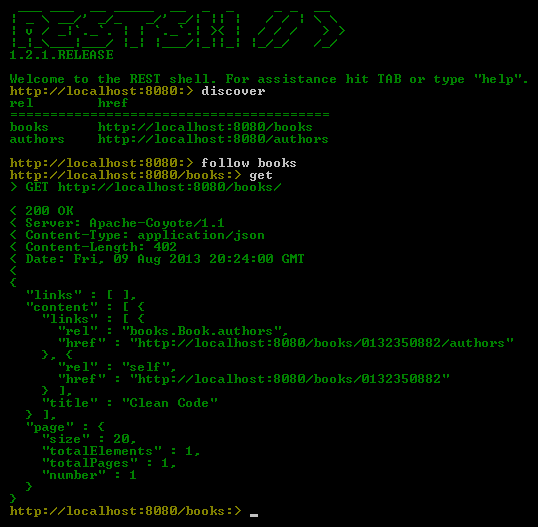 Once run, it lists all available resources on the root, so you can navigate from there. Fine! Now lets create an author and a book. Noticed how i used PUT to create the book? This is because its id is the actual isbn. I have to tell the server which isbn to use since he cant guess it. I used POST for the author as his id is just an incremental number that is generated automatically. Also, i used a link to connect both, the book (/books/0132350882) and the author (/authors/1). This is basically what hypermedia is all about: Links are used for navigation and relations between entities. Now, lets see if the book was created accordingly. Here is an Integration Test, following these steps automatically. It is also available in the example on github. We have created a complete RESTful webservice without much coding effort. We just defined our entities and database connection. spring-data-rest stated that everything else is just boilerplate, and i agree. Redeem yourself from hot deployments and OutOfMemoryException. spring-loaded is an opensource classreloader and a promising alternative to JRebel. It does not offer as many features as JRebel does, and it does not support any framework just yet. Nevertheless, its a great tool that can save the time you are waiting for that servletcontainer to restart again. It is not getting the attention that it deserves, so give it a try.